Cover of "Champ! The One and Only Alama Hunt", by Ira Phillips which is available at various local bookstores. Alma Victor “Champ” Hunt [1910-1999] was a cricketer who is considered by many to be the finest Bermuda has ever produced. Born October 1st 1910 in Bermuda, Champ was one of five brothers who represented Somerset in Cup Match. He scored his first century in an organized game at the age of 10, and played in his first Cup Match in 1927 at age 16. Champ was the first man to score half-centuries in both Cup Match innings, with a total of 147, a new aggregate record. His Cup Match career finished at 762 runs, which would have been substantially higher if he had not left to play professional cricket abroad. The left-handed batsman and right-armed fast-medium bowler moved to Scotland to play as a professional with Aberdeenshire, and during his time there he scored 22 centuries. He played twice for Scotland’s National Team in 1938 against Australia and Yorkshire. Although not selected, Champ was asked to play in trial matches to be considered for the 1933 West Indies tour of England, and remains to this day the only Bermudian to have had this honor. His eventual omission was more due to doubts about a Bermudian’s eligibility to play for the West Indies, rather then his ability. My hero was the Bermudan (sic) who bowled fast right arm and batted fast left hand. I had been brought up on stories about Alma Hunt, for before the war, my grandmother had lived in Hutcheson Terrace and, it appeared, she had been regarded by the club as the supernumerary fielder required to return Alma’s sixes from the very deep mid-wicket position represented by her back garden. He moved back to Bermuda after retiring from professional cricket, and became heavily involved with administration of cricket on the island. He was a widely respected official internationally who is generally credited with having first proposed the concept of a tournament for non-test countries. Champ passed away on March 5th 1999 at 88 years old. He is said to have asked for a bagpiper to play at his funeral to mark his connection to Scotland. He was posthumously inducted into the Bermuda Sports Hall of Fame in 2004. 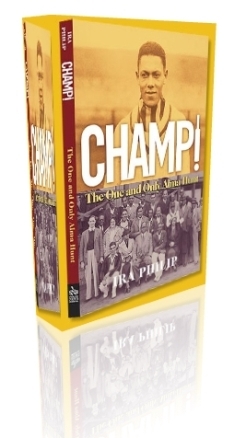 For further reading we recommend the book Champ: The One and Only Alma Hunt by Ira Phillips.